Venus, the jewel of the sky, was once know by ancient astronomers as the morning star and evening star. Early astronomers once thought Venus to be two separate bodies. Venus, which is named after the Roman goddess of love and beauty, is veiled by thick swirling cloud cover. Astronomers refer to Venus as Earth's sister planet. Both are similar in size, mass, density and volume. Both formed about the same time and condensed out of the same nebula. However, during the last few years scientists have found that the kinship ends here. Venus is very different from the Earth. It has no oceans and is surrounded by a heavy atmosphere composed mainly of carbon dioxide with virtually no water vapor. Its clouds are composed of sulfuric acid droplets. At the surface, the atmospheric pressure is 92 times that of the Earth's at sea-level. Venus is scorched with a surface temperature of about 482° C (900° F). This high temperature is primarily due to a runaway greenhouse effect caused by the heavy atmosphere of carbon dioxide. Sunlight passes through the atmosphere to heat the surface of the planet. Heat is radiated out, but is trapped by the dense atmosphere and not allowed to escape into space. This makes Venus hotter than Mercury. A Venusian day is 243 Earth days and is longer than its year of 225 days. Oddly, Venus rotates from east to west. To an observer on Venus, the Sun would rise in the west and set in the east. Until just recently, Venus' dense cloud cover has prevented scientists from uncovering the geological nature of the surface. Developments in radar telescopes and radar imaging systems orbiting the planet have made it possible to see through the cloud deck to the surface below. 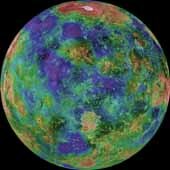 Four of the most successful missions in revealing the Venusian surface are NASA's Pioneer Venus mission (1978), the Soviet Union's Venera 15 and 16 missions (1983-1984), and NASA's Magellan radar mapping mission (1990-1994). As these spacecraft began mapping the planet a new picture of Venus emerged. 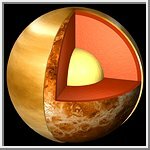 Venus' surface is relatively young geologically speaking. It appears to have been completely resurfaced 300 to 500 million years ago. Scientists debate how and why this occurred. The Venusian topography consists of vast plains covered by lava flows and mountain or highland regions deformed by geological activity. Maxwell Montes in Ishtar Terra is the highest peak on Venus. The Aphrodite Terra highlands extend almost half way around the equator. Magellan images of highland regions above 2.5 kilometers (1.5 miles) are unusually bright, characteristic of moist soil. However, liquid water does not exist on the surface and cannot account for the bright highlands. One theory suggests that the bright material might be composed of metallic compounds. Studies have shown the material might be iron pyrite (also know as "fools gold"). It is unstable on the plains but would be stable in the highlands. The material could also be some type of exotic material which would give the same results but at lower concentrations. Venus is scarred by numerous impact craters distrubuted randomly over its surface. Small craters less that 2 kilometers (1.2 miles) are almost non-existent due to the heavy Venusian atmosphere. The exception occurs when large meteorites shatter just before impact, creating crater clusters. Volcanoes and volcanic features are even more numerous. At least 85% of the Venusian surface is covered with volcanic rock. Hugh lava flows, extending for hundreds of kilometers, have flooded the lowlands creating vast plains. More than 100,000 small shield volcanoes dot the surface along with hundreds of large volcanos. Flows from volcanos have produced long sinuous channels extending for hundreds of kilometers, with one extending nearly 7,000 kilometers (4,300 miles). Giant calderas more than 100 kilometers (62 miles) in diameter are found on Venus. Terrestrial calderas are usually only several kilometers in diameter. Several features unique to Venus include coronae and arachnoids. Coronae are large circular to oval features, encircled with cliffs and are hundreds of kilometers across. They are thought to be the surface expression of mantle upwelling. Archnoids are circular to elongated features similar to coronae. They may have been caused by molten rock seeping into surface fractures and producing systems of radiating dikes and fractures. Magellan - Mapping the planet Venus. Flight over Western Atla Regio. Flight over Western Eistla Regio. A dramatic view the the moon with Venus in the distance. View centered at 90°E longitude. View centered at 180°E longitude. View centered at 90°W longitude. View centered at the north pole. View centered at the south pole. The Soviet Venera 9 and 10 spacecraft were launched on 8 and 14 June 1975, respectively, to do the unprecedented: place landers on the surface of Venus and return images. The Venera 9 Lander (top) touched down on the surface of Venus on October 22, 1975 at 5:13 UT, about 32° S, 291° E with the sun near zenith. It operated for 53 minutes, allowing return of a single image. Venera 9 landed on a slope inclined by about 30 degrees to the horizontal. The white object at the bottom of the image is part of the lander. The distortion is caused by the Venera imaging system. Angular and partly weathered rocks, about 30 to 40 cm across, dominate the landscape, many partly buried in soil. The horizon is visible in the upper left and right corners. The Venera 10 Lander (bottom) touched down on the surface of Venus on October 25, 1975 at 5:17 UT, about 16° N, 291° E. The Lander was inclined about 8 degrees. It returned this image during the 65 minutes of operation on the surface. The sun was near zenith during this time, and the lighting was similar to that on Earth on an overcast summer day. The objects at the bottom of the image are parts of the spacecraft. The image shows flat slabs of rock, partly covered by fine-grained material, not unlike a volcanic area on Earth. The large slab in the foreground extends over 2 meters across. On March 1, 1982 the Venera 13 lander touched down on the Venusian surface at 7.5° S, 303° E, east of Phoebe Regio. It was the first Venera mission to include a color TV camera. Venera 13 survived on the surface for 2 hours, 7 minutes, long enough to obtain 14 images. This color panorama was produced using dark blue, green and red filters and has a resolution of 4 to 5 min. Part of the spacecraft is seen at the bottom of the image. Flat rock slabs and soil are visible. The true color is difficult to judge because the Venerian atmosphere filters out blue light. The surface composition is similar to terrestrial basalt. On the ground in the foreground is a camera lens cover. This image is the left half of the Venera 13 photo. Surface Photographs from Venera 13. Surface Photographs from Venera 14.